I’m starting this experiment by seeking comments on the question,”Who leads KM in law firms and legal departments?” Thanks to ILTA and the KM Surveys that the ILTA KM Peer Group has published over the years, we have a good idea who leads KM. For the three years (2008, 2010, and 2012) during which the ILTA KM PG has done the surveys, they asked “What is the background of the primary person managing KM efforts/projects on a day-to-day basis?” I have looked at the results over the three surveys, plotted them on the above chart, and noticed some key data points and trends. First, the vast majority of people leading KM efforts in law firms and legal departments are: lawyers (both practicing and non-practicing), librarians, and IT specialists. Over the years, these have made up between 81% – 93% of the KM leaders. Second, there seems to be some trends surfacing. Lawyers (practicing and non-practicing) have always been the largest group of KM leaders – from 40% – 51% of the time. Recently there seems to be a trend toward non-practicing lawyers leading the way and practicing lawyers stepping out of the KM picture. Notice the decrease for practicing lawyers from 14% to 12% to 8%, while there is an increase in non-practicing lawyers (from 26% to 31% to 43%). 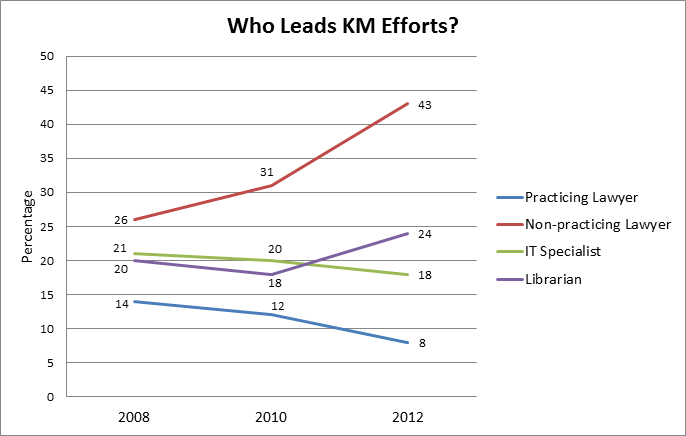 IT specialists leading KM seems to be slowly decreasing. Librarians leading the way saw a lull in from 2008 to 2010, but ticked up in 2012. Why is there a change in who is leading KM at law firms? What is your experience at your firm or legal department? Does this data support the claim that some have been making that “KM is dead” or does it indicate a revitalization of KM, or something else? What else does this data say about the state of KM leadership or KM (in general) at law firms and in legal departments? Do you have any other thoughts about this? I’m really excited about this, and I hope it works. I know many of the people who read this blog have a lot of good ideas about KM. I would love to share these ideas with others. Thanks in advance for taking part in my little experiment. And be on the lookout for other crowd sourcing posts that will give you opportunities to contribute to the book! Question: Does this data support the claim that some have been making that “KM is dead” or does it indicate a revitalization of KM, or something else? Response: I believe KM is alive and well but it has gone through a mutation from managing content (as a primary function) to managing processes (as in legal project management). When a matter is treated as a project and well-managed, it meets the client’s desire for transparency and cost-prediction, improves firm efficiency by enabling workflow and cost analysis as well as defining profitability through pricing strategies. Patrick, first of all, congratulations on your forthcoming book with the ABA. It will be a much needed contribution to the profession. I’m somewhat new to the “Knowledge Management” discipline within the law, but have become a serious student of it in the last year. My interest stems, in part, from my own obsession with the sister emerging discipline of “Legal Project Management,” in which I am becoming something of an emerging thought leader in my own right and in which I’m obtaining a Master’s Degree at NAU. What is interesting to me (and what first introduced me to “Legal Knowledge Management”) is how KM is so integrated into project management (“PM”). Although the terms, taxonomies and phrases within the two disciplines are different, but they both express the same, important thought. I think if KM is to gain traction in the legal profession it will have to come from senior attorneys. In my view, they have the maturity of experience to grasp and appreciate what statistical data has already borne out – namely, that 80% of all problems in and complaints about an organization arise from PROCESS ERRORS, not errors of judgment. The other reason for this trend of ‘older, non-practicing lawyers’ leading the way is, I suspect, the realization that their hard-acquired knowledge will die with them if not meaningfully preserved. Young people live in the present, but old people often live in the past as they have more memories to relish than do their younger colleagues. Perhaps it is the realization of their own mortality that is now prompting the ‘Baby Boomer’ leaders of law firms to think about such matters.